but never remembered it tasting so good. It was also nice to know that something is still baked on Manhattan’s Lower East Side. The other night we went to Pylos, a popular Greek restaurant in the East Village. We should have known what sort of attitude you might find from the first page of the menu where consulting chef Diane Kochilas is described as the world’s foremost authority on greek cuisine. Not a bad distinction for a New Yorker of Greek descent who has lived in Greece since the all the way back to the early 1990’s. Despite not having a reservation, we were able to get a table but only if we finished by 9pm. This sort of agreement is never a great way to start a meal but we took the table anyway. And I’m glad we did.The food was excellent. We ordered a bottle of 2006 Zoe Skouras, a rose from the Peloponnesos region in Greece and made from the agiogitiko (also known as St. George) grape. Full disclosure - this was the first Greek rose I have ordered. We told our waiter we would start with a few mezethes (appetizers) and he quickly took away all but one our menus. We had Greek giant beans baked in a honey-scented tomato-dill sauce, poikila - a trio of tzatsiki (yogurt dip) , taramosalata (fish roe dip) and melitzanosalata (eggplant dip); horiatiki (classic greek salad) and saganaki – three greek cheeses melted in a clay pot. We ate these with freshly grilled pita bread. With our 9pm deadline approaching, we decided to have have just a few more appetizers – spanakorizo (spinach-rice pilar served with feta, lemon and cracked black pepper; htapothi (grilled octopus with a balsamic sauce and capers) and keftedakia (light-as-air meatballs, pan fried in olive oil). With just a few minutes before the hour, we asked if they any small sweets like Greek cookies. Our waiter told us “no we don’t have any Greek cookies” in a not-so-nice way (think Mike Mulligan). Much to our surprise, the deadline was pushed back for a bit allowing us to have two desserts – galaktobourekakia (phyllo triangles filled with Greek custard and drizzled with honey) and yaourti straggismeno (drained Greek yogurt served with sour cherry, Greek honey and walnuts. Everything was excellent. Its just too bad the service didn't match the comfort food. 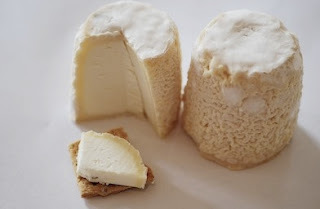 Chabichou du Poitou <pictured> (won name-protection (AOC), guaranteeing the authenticity of its origin. It is made in the very small geographic area above the chalky soils of the threshold of Poitou, halfway between Paris and Bordeaux. ); Camembert Chatelain (Camembert is an AOC cow's milk cheese from the Normandy region in northern France) ; Delice de Bourgogne (a triple-cream from Burgundy) and finally a blue Fourme d'Ambert (Legend says it was already made at the time of the Druids and the Gauls; one of the oldest cheeses in France along with Roquefort. Made in the Monts de Forez of Auvergne. Since 2002it has had an AOC grade). We of course had a few baguettes. All this was paired with 2005 Domaine Jaume Côtes du Rhône Villages Vinsobres Altitude 420 (Vinsobres AOC was created only in 2005 , made Grenache (obligatory) and a blend of Syrah and/or Mourvedre). Finally for dessert we had a chocolate moose cake. I’m not sure we could have stormed the Bastille after that lunch. Reviews of the Wines of EatWells LiveWells - we had some wonderful stuff on the oval that evening! Henri Boillet 2003 Batard Rich aromas of yellow plums and apricots are found in the nose. concentrated, plush, dense, packed w,sweet, pulp-laden white fruits. plump, soft, suave, generous; exhibits a long fruit-filled finish. If you're looking for something other than cheese and bread for your picnic, Mark Bittman, the Minimalist of The New York Times , posted a list of 101 suggestions.